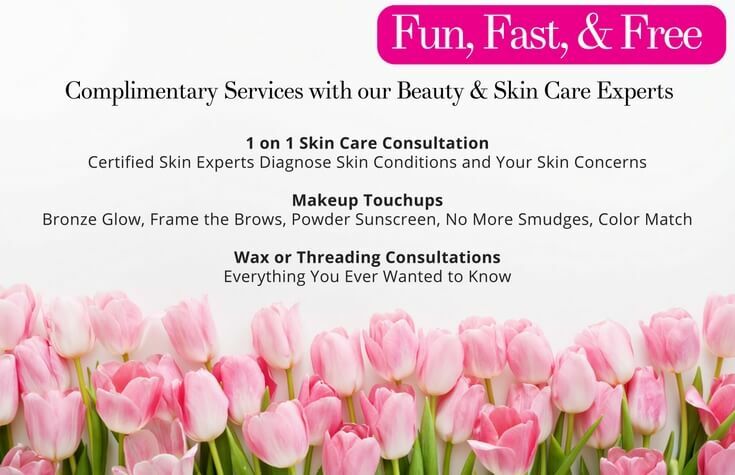 One of our highly trained, certified skin specialists will first review your skin care questionnaire. This highlights your lifestyle, environment, medical and cosmetic usage history. All of these factors affect the skin and how it works. Next your skin is analyzed under a 5X Magnifying light to test for oil, hydration, dehydration and other factors. Our estheticians also look at pigmentation and feel the skin for under ground toxins. Next comes a discussion with you on exactly what you are looking for. Do you want skin that is more radiant and glowing? Trying to get rid of acne? Tired of some of your fine lines? Just want a quick pick me up? We will help you wade through the customized solutions to find just the right plan for you. Are you looking for products to use at home or are you looking for skin treatments? Even if you are just coming in to research, we are there to give you our professional advice and skin care expertise. Need a few quick tips or a new item to add to your every day makeup bag? Our makeup and spa concierge experts can get you in and out in a flash. Looking to flatter in seconds? We can help with a Bronze Glow (Who Doesn’t Like to Look Healthy), Frame the Brows (Let the Arch Angels Give Your Eyes a Frame), Powder Sunscreen (Best Invention Ever), No More Smudges Waterproof Eyeliner, or a Vegan Liquid Mineral Foundation Color Match (Skin Care Makeup that is Flawless). Yes, we know….maybe a little too much information. But wouldn’t it be nice to at least ask? That’s why our experts are available for a consultation for any and every question you want to ask on waxing or threading. We can think of 100 questions, and so can you. Does it hurt? What happens when you wax there? Will the hair come back thicker? And more! Whether you’re looking for money-saving deals or spa packages, Bella Reina offers seasonal specials and luxurious treatments. Check our monthly spa deals for the best exclusive offers. We offer beauty and deals, including last minute getaways and special packages. By signing up for email, you will always be in the loop for the latest and greatest deals. Bella Reina Spa is the quintessential boutique luxury Spa in Delray Beach Florida. Just blocks away from Atlantic Avenue, the amazing shops and restaurants, we offer a relaxing oasis to the “All-American Fun City”. Close to the sandy beaches, Bella Reina Spa is only 20 minutes from Palm Beach and even closer to Boca Raton. Spa deals and packages are inspired by our philosophy of organic, vegan and the three Bella rules of Beauty. We use organic massage lotion, organic skin care, vegan makeup and organic aromatherapy essential oil blends in all of our treatments. With each monthly special, soothing therapeutic touch combined with wellness assures that all treatments will have remarkable results. Call today make an appointment, and we look forward to your arrival.